Ranks and Grades at time of last combat Mission. 1Lt Robert W. Snyder (P) - First three missions flown as Co Pilot with 1Lt Lester A. Lake as combat orientation Pilot. Two additional missions flown as CoPilot with other Pilots: 1Lt Calder L. Wise on his last mission (118); 1Lt Raymond Hoffman on his 26th and last mission. Lost one engine in a fighter attack before reaching the target. Near the target, flak damaged another engine and its propeller ran away and could not be feathered. Realizing that they were badly damaged and low on gasoline, the crew opted to head for Switzerland. 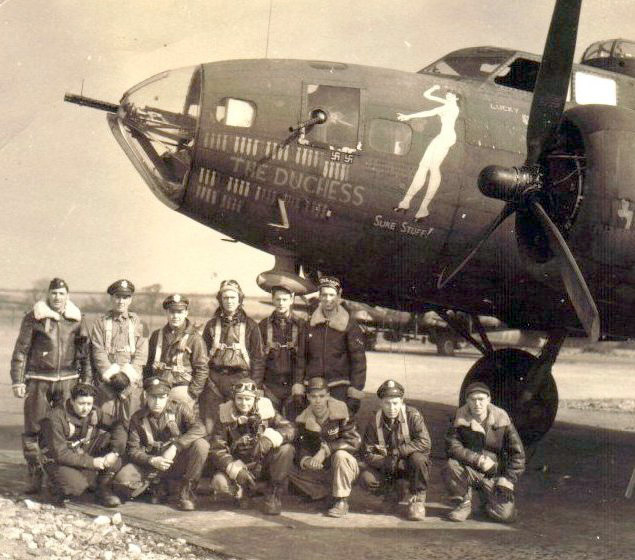 They landed at Zurich with twelve flak holes in the B-17 and were interned. See Interned in Switzerland. The other twenty-one dispatched missions of 1Lt Snyder were flown as First Pilot. 1Lt John H. Cook (CP/P) - Flew as CoPilot on 16 credited missions with seven different Pilots: 2Lt Robert W. Snyder (7 missions - 102, 103, 105, 106, 109, 112, 113); 2Lt Arnold S. Litman (1st mission - 88), 1Lt Lester A. Lake, Jr. (3 missions - 94, 97, 101); 2Lt Jack W. Watson (1 mission -108); 1Lt Joe R. Worthley (2 Missions- 110, 111), 1Lt Thomas R. McClure (2 missions - 136, 137); 1Lt Joseph R. Moreau (1 mission 153) . Was upgraded from CoPilot to Pilot on orders dated 01 May 1944 and flew his first mission as First Pilot on 30 April 1944 (Mission 145). Flew 16 additional missions as First Pilot (146, 151, 152, 157, 161, 164, 167, 170, 171, 172, 176, 180, 181,183, 184, 186. Last fourteen First Pilot missions as a Squadron Lead Crew Pilot. 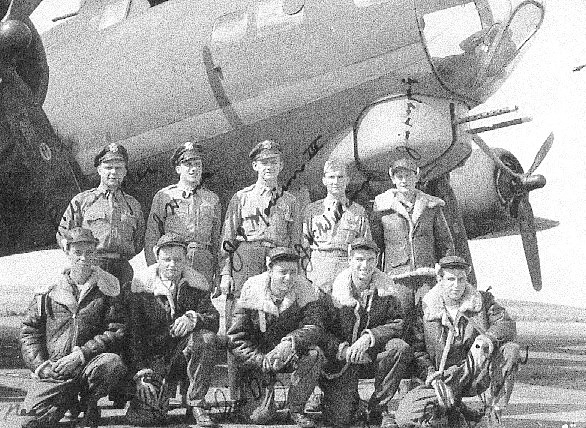 Eleven of his seventeen First Pilot missions were flown in B-17G 42-97198 The Floose (358BS) VK-H. Completed 34 credited missions combat tour on 20 June 1944 (Mission 186). 2Lt Jack N. Williams (N) - Flew on 14 credited missions with 1Lt Snyder (100, 102, 103, 105, 106, 109, 112, 113, 114, 117, 118, 122, 123, 124) and 16 credited missions with other pilots: Regular missions (88, 101, 110, 111, 125, 126, 129, 130, 131, 136, 137, 151); Lead Crew missions (147, 155, 158, 160). Completed 30 credited missions on 25 May 1944 (Mission 160). 1Lt James P. Morrison (B) - Flew on 16 credited missions with 1Lt Snyder (93, 99, 100, 102, 103, 105, 106, 109, 112, 113, 114, 117, 118, 122, 123, 124) and 19 missions with other Pilots (1st Combat tour - 94, 97, 101, 110, 111, 125, 126, 129, 130, 131, 132); 2nd combat tour (208, 212, 216, 221, 222, 224, 229, 230). Completed 37 credited combat missions on 18 August 1944 (Mission 230). 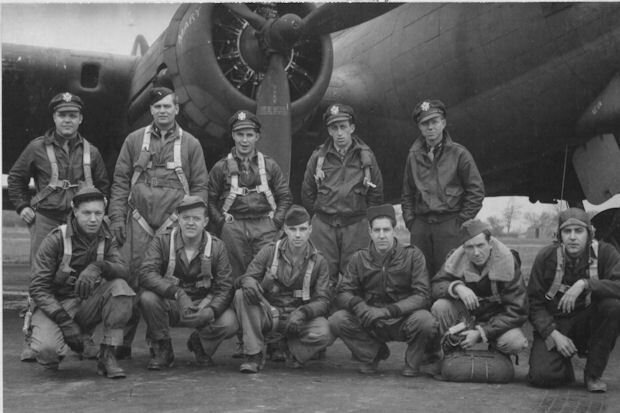 T/Sgt Jerome J. Haggerty (E), T/Sgt Charles W. Rumpf, Jr. (R), S/Sgt Neil T. Chadick (BTG), S/Sgt Jessie L. Delaney (LWG) and S/Sgt John L. Hunt (TG) Flew with the 1Lt Snyder crew on their first 16 credited missions (93, 99, 100, 102, 103, 105, 106, 109, 112, 113, 114, 117, 118, 122, 123, 124). Flew on twelve missions with other Pilots as Follows: 1Lt Lester A. Lake (94, 97, 101); 1Lt Joe R. Worthley (110, 111, 131, 132, 134, 136, 142); Lead Crews - Major Mitchell (127) and LtCol Lyle (141). Completed combat tours on 27 April 1944 (Mission 142). T/Sgt Christopher Balzano (RWG) - Flew with 1Lt Snyder crew on their first 16 credited missions (93, 99, 100, 102, 103, 105, 106, 109, 112, 113, 114, 117, 118, 122, 123, 124). Flew on 14 missions with other Pilots as follows: 1Lt Lester A. Lake (94, 97, 101); 1Lt Joe R. Worthley (110, 111, 131, 132, 134, 136). As a Lead Crew Radio Operator (137, 145, 147, 152, 233). Completed 30 credited mission combat tour on 27 Aug 1944 (Mission 233).